As many countries across the world begin to wind down their Christmas holidays, in Spain, the celebrations are still in full swing. The first week of January is a magical time to visit Barcelona as the people of Catalonia continue to buy gifts, prepare feasts and enjoy the twinkling Christmas lights as they ready themselves for the arrival of Los Reyes Magos. Also known as the Three Kings or the Three Wise Men, these biblical characters bring the holiday season to life in Barcelona, as families come together to exchange presents, indulge in sweet treats and celebrate in the streets as they eagerly await January 5th and 6th when the Kings appear and give gifts to the children. 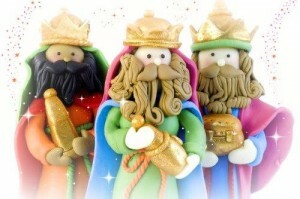 Celebrated on January 6th, the Three Kings Day, also known as the Epiphany, finds its roots in the Gospel of Matthew. Here, the story goes that the Three Wise Men made their way from the East all the way to Bethlehem in order to visit and bring gifts of gold, frankincense and myrrh to the baby Jesus. Nowadays, this day is filled to the brim with festivities, as kids receive their own gifts from the Kings: Baltasar, Melchor and Gaspar. That being said, the celebrations of the Reyes Magos begin on the evening of January 5th, as the Kings arrive in each town of Spain. While the smaller towns surrounding Barcelona offer some pretty magical celebrations to welcome the Reyes Magos, there is no better place to enjoy the festivities than at the Three Kings Parade in Barcelona, aka la Cabalgata de los Reyes Magos. Thousands of children and adults alike line the streets of Barcelona on January 5th to see this much anticipated parade, which kicks off at Av. del Marquès de l’Argentera where the Three Kings will arrive at around 6pm, travel a massive 5km around the city, and finally stop near the Montjuïc Magic Fountains at approximately 9.30pm. This vivid Barcelona parade has it all with live music, bright costumes and large, uniquely decorated floats. The three main floats are the ones that transport each of the Kings and their helpers who throw candy to the crowds as they pass by. 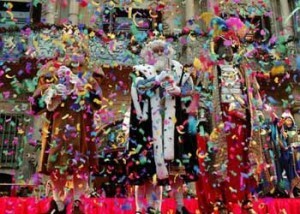 The parade also offers the opportunity for children to give their wish lists to the Kings, in the hopes that they will receive just what they asked for the very next day. After the excitement of the parade, families return home, where children leave out food for the Kings, water for their camels and a pair of shoes outside the door or window, so that when the Kings pass by they will fill them with gifts. As they awake the next morning, anxious to see what the Wise Men have brought them, some may find a lump of sugar-coal, especially those youngsters who have misbehaved during the year! 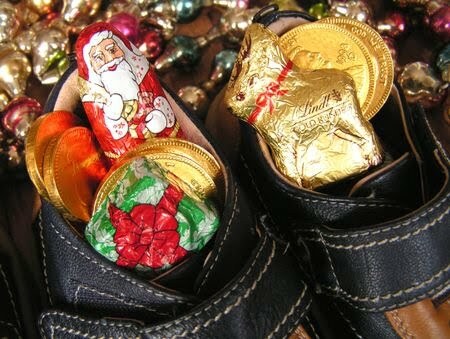 As mentioned before, the day of Reyes is one when families to come together and enjoy a feast fit for a King himself! On the Three Kings Day, the typical dessert is the Roscón de Reyes. This round cake is filled with cream and topped with candied fruits, as well as two more elements. Hidden in the Roscón de Reyes is a dried fava bean, as well as a small king figurine. Custom holds that those who find the king in their portion are crowned King (or Queen) for the day, while those that stumble across the bean have to pay for the dessert! If you’re in Barcelona on the Three Kings Day, you can find your own Roscón de Reyes at many bakeries in the city. There are also plenty of restaurants in Barcelona offering top Reyes Day meals where you can experience your own King’s feast. If you’re thinking of coming to Barcelona around the time of the Three Kings Day, then we recommend one of the many Eixample apartments in Barcelona for your stay. Here, you will be right in the center of the action, meaning that you won’t miss a minute of the merriment and joy that fills the city during this magical time! 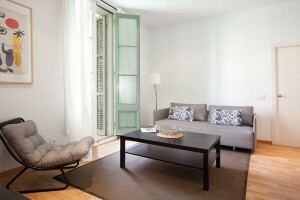 Book your apartment now!